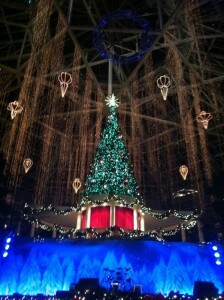 The Gaylord Palms Resort is known for their holiday ICE! attraction during the Christmas season but another hidden gem not publicized as much is their Christmas Tree Lighting and Light Show that is held on select nights at the resort. With a live band and caroling bringing the season to light, over 2 million twinkling lights are synchronized to music for a Christmas Light show. The best part is that the show is free for guests of the hotel. The Christmas Tree Lighting and the main Christmas Lights show are held during two different performances. The Christmas Tree lighting happens soon after sunset at 6:15pm with about a 10 minute caroling show that leads to the lighting of the Christmas Tree. 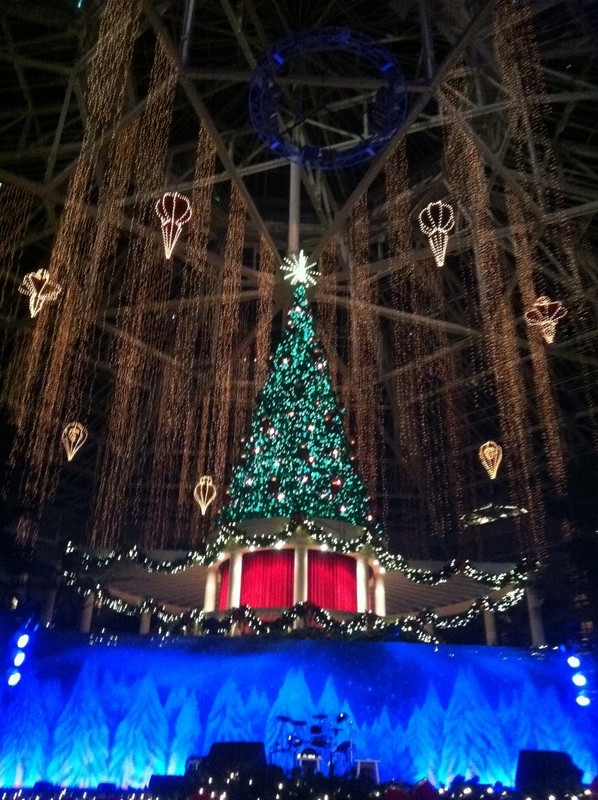 The tree is 54 feet tall that looks over the St Augustine Atrium in the center of the hotel. Click here to view the dates of the Majestic Christmas Tree Lighting. Watch the video below to see the 2012 Christmas Tree Lighting ceremony and click here to see the entire musical performance that accompanies the ceremony. Immediately following the Christmas Tree Lighting Show and with several other shows afterwards, the Gaylord Palms produces the main event of their Luminescence Christmas Tree Light Show that features the musical group the Edge Effect with a live band. The Luminescence concert lasts about 22 minutes with about 4 minutes of the show dedicated to the light show of the Christmas Tree and surrounding lights. Click here to view the dates and times of Luminescence – featuring the Edge Effect. Below are the segments from the Luminescence show that is dedicated to the Christmas Tree and Light Show. You can view the entire performance here. If you like the Christmas Tree Light Show at the Gaylord Palms, also check out the Osborne Family Spectacle of Dancing Lights at Disney’s Hollywood Studios and the Singing Christmas Trees show at First Baptist Church of Orlando. This entry was posted in Attractions and tagged christmas, december, gaylord palms, holidays, hotels, kissimmee, new years eve, november, shows, thanksgiving. Bookmark the permalink.